Shares in electric car maker Tesla have risen after founder Elon Musk said its new Model 3 car would be ready by Friday, two weeks ahead of schedule. Mr Musk said the five-seater car - its lowest-cost vehicle to date - had passed all its regulatory tests. "Expecting to complete SN1 [serial number 1] on Friday," he tweeted, referring to the first car off the production line. Tesla's shares rose about 2% on Monday as investors welcomed the news. Production should reach 20,000 cars a month by December, Mr Musk added. The Model 3 is Tesla's attempt to break into the mass market for car drivers. 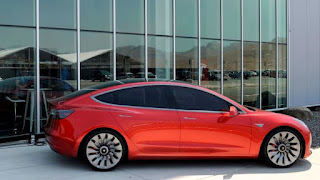 The basic model will start at $35,000 (£27,000), nearly half the price of Tesla's current cheapest car. Mr Musk has previously said his goal is to produce about 500,000 vehicles a year once production is at full capacity. Earlier this year, Tesla overtook General Motors and Ford as the most valuable US carmaker, even though it only built 84,000 cars in 2016. The firm was valued at $60bn on Wall Street on Monday, compared with $54bn for General Motors and $46bn for Ford.